Former World Keirin Champion Jamie Staff beat Great Britain team-mates Craig Maclean and Jason Kenny in a two-up sprint at the Revolution 20 meeting at Manchester on Saturday night, with the race widely being tipped as a deciding factor in who will lead out the team sprint for GB at the World Championships later this month. Staff teamed up with Ross Edgar to win the event, clocking 30.876 seconds for his flying 250 metres and beat Kenny into second and Maclean into third. The event was just one of many which had attracted another capacity crowd to the Velodrome. Rugby World Cup winner Martin Johnson proved a big draw for his charity Italian Pursuit battle with Geoff Thomas, although it was Thomas who took the victory. 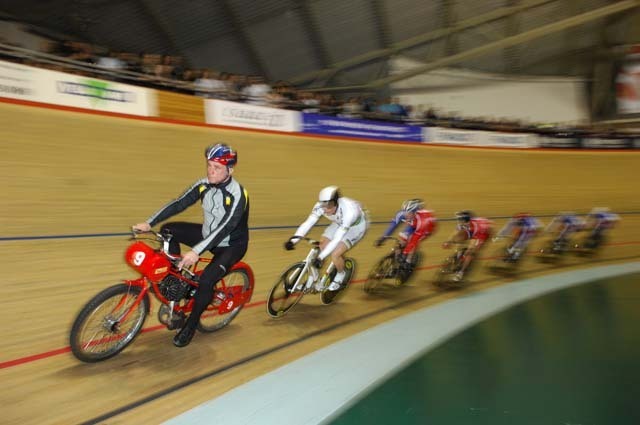 The celebs had completed the first lap before peeling off and, after other riders had done battle, it left Chris Hoy to beat Arnaud Tournant in the final leg and secure the win. Hoy and Tournant teamed up later in the evening for the 1km Madison time trial, and proved victorious, their time of 54.549sec beating Iljo Keisse and Dimitri DeFauw into second spot, while Johnny Bellis and Peter Kennaugh took third. For more on the Revolution 20 meeting, see this week?s Cycling Weekly.